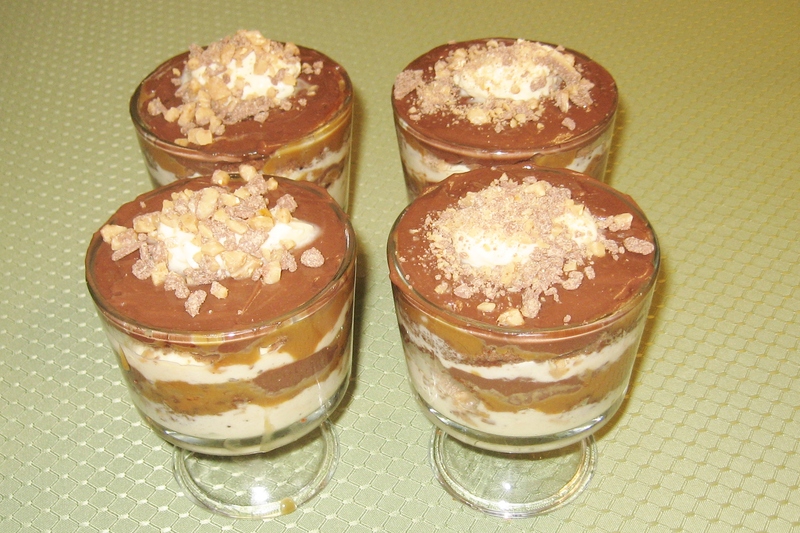 That is my personal creation: Chocolate Caramel Heath Bar Trifle. And it was delicious! When our good friends, R & K were leaving the cookout, R said, “Next time, I want a Caramel Heath Bar Trifle.” Challenge accepted. When they invited us over for dinner this past weekend, I knew just what to bring. 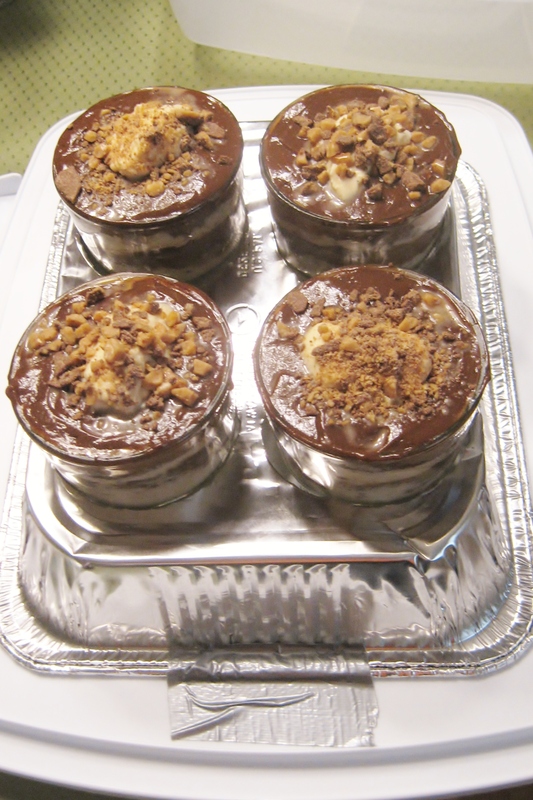 I borrowed the chocolate cake recipe from the Triple Chocolate Peppermint Trifle because it’s a dry cake recipe. So that was easy. I bought Jello chocolate pudding from a box, so that was easy. (Don’t let anyone fool you into thinking that you have to make pudding from scratch. It’s 2012 for goodness sake.) So the hard part was the caramel and the mousse. I searched Google for a caramel mousse recipe but I couldn’t really find one. They all seemed really complicated and not very caramel-y. I did find this one that was fairly simple. I can’t bring myself to spend $15 on a vanilla bean, so I used a teaspoon of vanilla and some Tahitian vanilla sugar instead, which I just happened to have on hand of course. Thanks Elizabeth! Instead of the caramel syrup from the recipe, I melted some Kraft Caramel Bits and folded it into the whipped cream mixture. Caramel is sticky and doesn’t fold so well, so it was definitely a challenge to get it all blended. Honestly, I probably should have bought the caramel sundae topping instead of the caramel bits. I’m not really sure if I made mousse or flavored whipped cream. It was delicious, nonetheless. I melted the rest of the caramel with some whipping cream in the microwave to make the caramel sauce layer. I couldn’t see making a big trifle for 4 people, but I found these mini trifle bowls at Bed Bath and Beyond for $10. (Made in the USA!) I baked the cake in a 13″x9″ rectangular cake pan instead of a round cake pan. This made the cake thinner gave me enough surface area for 8 rounds. I layered the trifle mousse, Heath, cake, caramel, pudding and repeat. You might be asking, “But how did you transport it the 45 minutes to R & K’s house?” (Okay, you probably weren’t, but we sure were!) Luckily, I’m married to McGyver and he came up with this: a roasting pan with trifle bowl sized cutouts duct-taped to a cake taker. He’s a genius! The trifle was everything I hoped it would be. K even said that she would be so happy if she ordered this in a restaurant. That’s probably the best compliment my baking has ever received! 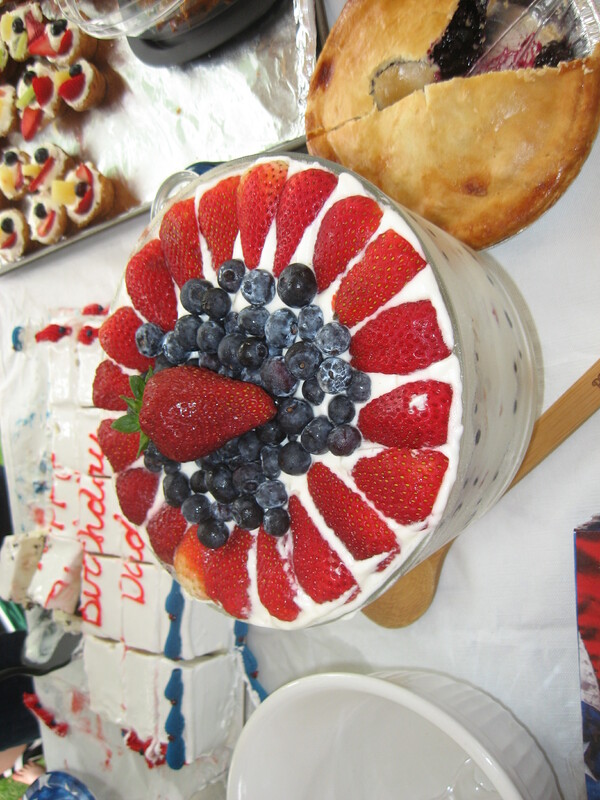 This entry was posted in Culinary School Graduate and tagged baking, recipes, trifle. Bookmark the permalink.